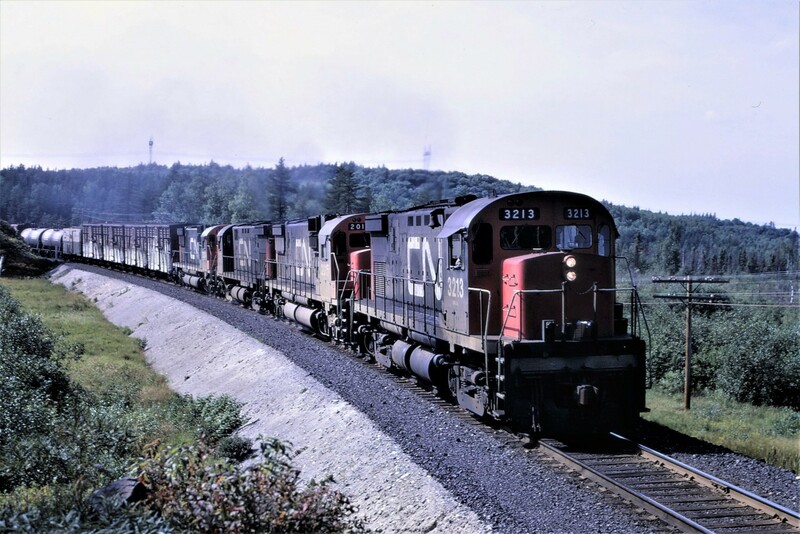 Railpictures.ca - First954 Photo: September 6th, 1970 sees train 308, running as time table train 894, heading east out of Capreol, Ontario on the now abandoned Alderdale Sub. Power for the train is C424 3213 C630 2015 C424 3227 and along for the ride a dead C630 2024. Actual location is about 3 miles east of Capreol. | Railpictures.ca – Canadian Railway Photography – photographie ferroviaire Canadienne. Copyright Notice: This image ©First954 all rights reserved. Caption: September 6th, 1970 sees train 308, running as time table train 894, heading east out of Capreol, Ontario on the now abandoned Alderdale Sub. Power for the train is C424 3213 C630 2015 C424 3227 and along for the ride a dead C630 2024. Actual location is about 3 miles east of Capreol. Ah ok, I’m more familiar with the Beachburb Sub side of it in the Ottawa Valley. The Alderdale Sub. ran 144.8 miles between Capreol and Brent, Ontario. It ran through North Bay and Algonquin Park. The last through train on the subdivision was on November 24th, 1995. The majority of the rail was lifted by September 1997. The few miles from Nipissing to North Bay were added to the Newmarket Sub. Where did the Alderdale Sub go and when was it abandoned? Awesome pic! Love the stock cars on the head end.